It's that time of year when we give thanks to our readers and highlight our most read posts of 2016. This list reflects the AFP Community Blog's growing audience; as compared to last year, when only one post was viewed more than 1000 times, this year five passed that mark. The next time a healthy adult of any age asks me if he or she should be taking a vitamin D supplement, I plan to answer: we don't know for sure, but probably not - and we don't need to know what your vitamin D level is, either. Podcasts, and their ability to make us engage with others’ stories, might be useful to physicians as they look for ways to take in new information, and above all, try to stay tuned in to the underlying messages their patients are sharing. Because the rapid strep test produces either a false positive or a false negative result a significant minority of the time, it is most useful in patients with an intermediate pre-test probability of having strep pharyngitis. Prescribe naproxen alone for most patients with acute low back pain and no contraindications to nonsteroidal anti-inflammatory drugs (NSAIDs); reserve cyclobenzaprine for patients who can't use NSAIDs; and prescribe oxycodone/acetaminophen only in patients who can't tolerate NSAIDs or cyclobenzaprine. Metformin has a proven mortality benefit for all patients with type 2 diabetes, even those on insulin. Metformin is so beneficial that clinicians should only consider discontinuing it if a patient's GFR is less than 44 mL/min, not just because the serum creatinine level is > 1.5 in men or >1.4 in women as previously recommended. Unfortunately, the placebo effect with hyaluronic acid comes with cost and risk; injections can cost hundreds of dollars for one dose, and typical therapeutic regimens involve a series of 3-5 injections over several weeks. A new clinical practice guideline reviewed the comparative effectiveness of treatment for major depressive disorder and recommended that "clinicians select between either cognitive behavioral therapy or second-generation antidepressants after discussing treatment effects, adverse effect profiles, cost, accessibility, and preferences with the patient." This study will change the way I speak with parents and adult patients about my decision not to prescribe antibiotics. I will make sure not to trivialize their concerns or refer to an illness as "just" a virus, and I will aim to use objective language to describe my rationale either way. Medical students, other specialists, and even the lay public often have questions about Family Medicine. Kozakowski et al answer these questions and many more in "Responses to Medical Students' Frequently Asked Questions About Family Medicine." Offering a screening test directly to consumers prior to establishing its clinical utility is presumptuous at best and exploitative at worst; hopefully our patients will discuss the shortcomings of this test, and ovarian cancer screening in general, with us prior to spending $295 on it. The conclusion in AFP’s latest Curbside Consultation is unlikely to come as a surprise to anyone with a pet at home: animal companions do more than make us happy. They can be valuable for enhancing our health, too. The benefits of having a pet are strong enough that a recent article on pet-related infections is careful to dispel misconceptions about whether it is necessary to rehome an animal because of a zoonotic disease. Asking about pets during an office visit can serve a larger purpose than preventing or treating a cause of infection, however. These conversations can help motivate patients who are striving to meet personal wellness goals, including quitting smoking. Such areas of overlap between animal and human health are common. In fact, worldwide, advocates for the One Health initiative increasingly encourage clinicians and veterinarians to recognize their interests in their patients as a shared project. Pets’ positive impact on loneliness is one of many areas that researchers have looked into as they explore how to optimize health for humans and animals. Loneliness is especially prominent among older adults, with those older than age 80 years at the highest risk. The deleterious effects of prolonged feelings of social isolation have been well reported in the media, and include serious harms such as cognitive decline and even early mortality. Patients who are experiencing chronic loneliness may be reluctant to admit it, however. In these cases, a question about contact with animals becomes a potentially valuable way to explore patients’ day-to-day social interactions. 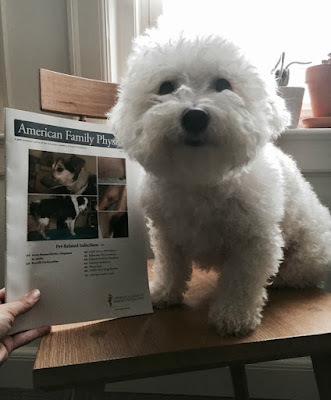 Pablo, my bichon frise, poses with AFP's November 15 issue. What should physicians do if they suspect a patient is lonely and he or she doesn’t have a pet at home? This could identify patients who need help developing deeper social connections. Higher rates of loneliness among those who live by themselves and are without a pet could indicate a need to follow-up with the patient about how lack of contact with others might be affecting quality of life. Patients who otherwise reply that they have interest in getting a pet but are not sure about caring for one in their older age will find reassurance from a physician useful. If there are no major contraindications to pet ownership, physicians can check that patients with limited access to transportation are aware of mobile veterinary and grooming services, and recommend contacting a local veterinarian’s office about free or low-cost animal care programs in the area. Additionally, many nonprofits are committed to helping older persons care for pets. Some U.S. shelters receive funding specifically for this purpose, and others are involved in foster networks that place animals with senior citizens while a permanent home is sought. Many of the nation’s Meals on Wheels programs will even deliver pet food to the people they serve if they have a pet at home. Do you have a pet that’s improved your well-being as you’ve worked to improve your patients’? Listeners of AFP Podcast recently tweeted pictures of some of family medicine’s animal friends at the show’s Twitter account. With a dog of my own at home (see photo), I am always grateful that I can count on getting some “pet therapy” time at the end of every day, especially when there’s been a deadline. Marselle Bredemeyer is Associate Editor, AFP Online.